In the Scottish Borders the minor roads seem to wind their way forever around the low rolling hills, following river valleys and then slowly climbing to reveal views of rich farmland. 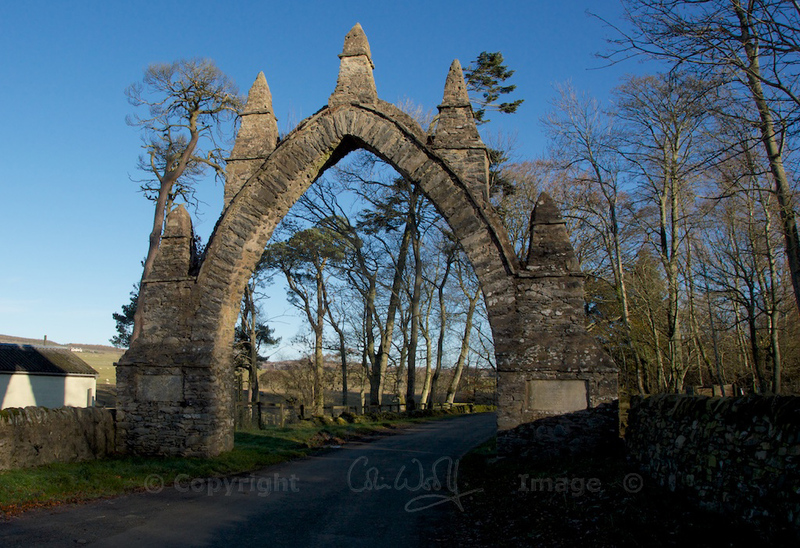 A few miles to the east of Lauder are two stone arches, set about a mile or so apart on the same road. I have looked for information about them online, but there is very little available. I believe they date from the 1700s, and I can only imagine that they were put up to mark the boundaries of an estate. I haven’t heard these words before, and I wonder what led someone to have such a salutary warning set in stone. It was impossible to make out the words on the other side of the pillar, as they had been worn almost entirely away. It’s surprising what you come across along country lanes! “Spottiswood House was ‘Jacobethan’ style, huge, and built 1832-4 by the architect William Burn. 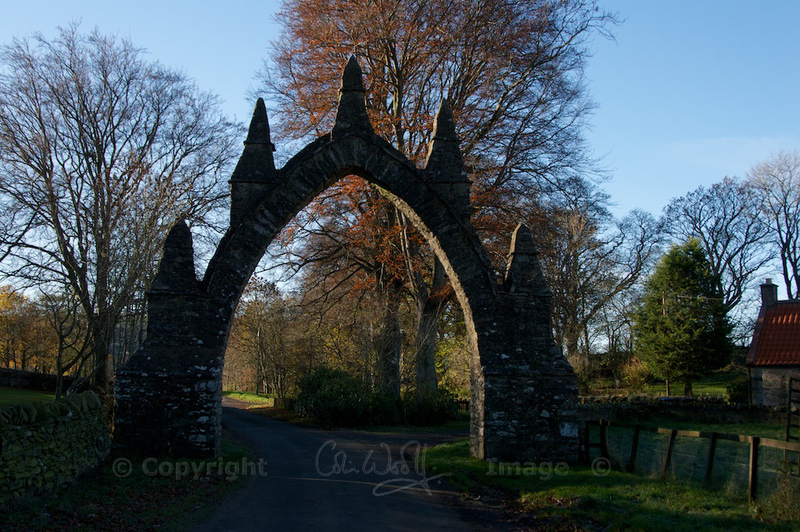 The Gothick archways at Pyatshaw and Bruntaburn were part of its policies and landscape, and the various inscriptions are the work of Lady John Scott (Alicia Anne Spottiswood), a noted antiquarian who excavated a number of burial mounds in the area. I found an old postcard with a view of the house on the Dunse History Society website. In the opinion of the RCAHMS, “It is very likely that the first house of Spottiswoode was a tower-house of late medieval date”, but this original building was obviously much altered by successive generations. 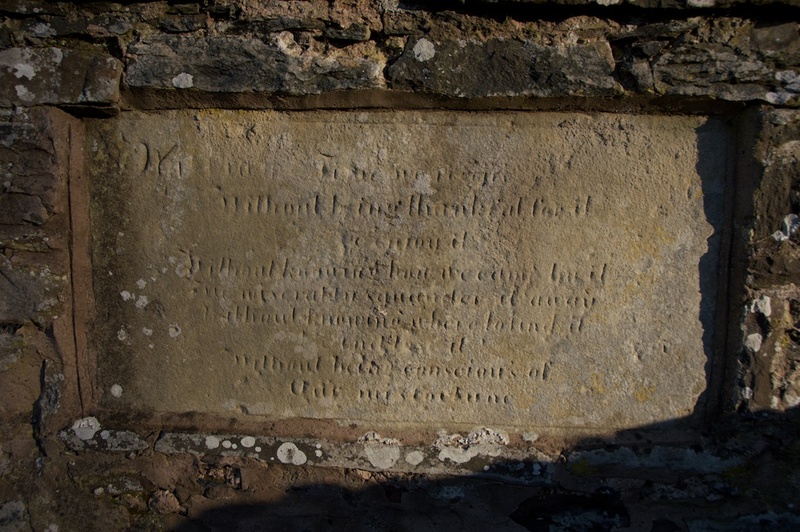 Peter Munro, the Chairman of the Borders Family History Society, has found the wording of the inscription in a 1770 copy of the Town & Country Magazine (see also his comment below). I’m indebted to the Society’s secretary, Ronald Morrison, and to Peter Munro and their committee for helping me with this mystery. Since my own maiden name was Scott, I am even happier! The Scotts were one of the predominant families of the Scottish Borders. It seems that Alicia Anne’s family name, Spottiswood, has roots that go back to the 13th century, to the reigns of Alexander III and Robert the Bruce. What an amazing, and intriguing, find. It really gets the imagination firing doesn’t it? It certainly does, Rachael! You could write a book around them! I don’t remember seeing anything in quite this style before. Oh the mystery deepens, how fantastic! Okay now that I’ve snapped myself out of the magical reverie your blog always evokes, I had to do a little snooping around. The second to last sentence is what caught my attention and I wonder if the two arches are ports. I would never judge you ignorant, and thank you so much for taking the time to look this up! I didn’t know that Lauder had ‘ports’ in its walls, although I am not surprised that the town has such ancient roots. In this case, I think the two arches are too far from the town to have this purpose, and to me they look more decorative than defensive. I am inclined to think that they date from the late 1700s when the Spottiswoode Estate was ‘greatly expanded’ according to a local report, with gatehouses and lodges being built, presumably for staff and gamekeepers etc. The entrance to the old Spottiswoode House lies between them on the minor road, although the house itself has been demolished. Just speculating now, but they could have been put up as a memorial to someone (the inscription doesn’t suggest a happy occasion!) – perhaps a local landowner. None of the online historical databases have any record of the inscriptions. If I find out any more, I will update the information! You and your blog will get top billing in the thanks if I ever manage to finish my book for your amazing inspiration. Haha, bless you! 🙂 Glad to be of help! This is known as the Pyatshaw Archway. It’s just off the A697 near Dod Mill. A similar archway (now covered with ivy) is said to be at Bruntaburn Mill. Read my column, Kith and Kin, every week in the Border Telegraph and Peeblesshire News. Follow the Society @BordersFHS on Twitter. That’s wonderful to have the full inscription – thank you. Do you happen to know who had the arches put up, and when or why?